This is a small sample of the unique and infinite variety of one of a kind tables and desks handmade by Once A Tree. The fine woodworking here represents a personal desire for quality and craftsmanship. 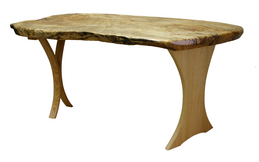 Steve Shafer has designed office furnishings, organic desks, artistic tables and antique inspired coffee tables. Tables, Desks, Workstations. It sure is nice not to have to sit on the floor. The main requirement for a table is to hold things up off the floor. After the basic design needs are met the design of your table is open to anything you can think of: Metal, glass, ceramic or best of all, wood. An organic approach is to simply use a slab cut from the tree. Take this raw material of wood, smooth and polish it, put on a protective finish that shines and brings out the natural beauty of the tree. Some say this is the soul of the tree (see George Nakashima’s book titled “The soul of a Tree: A Master Woodworkers Reflections”). Most often though, trees are milled into boards to create building blocks. Woodworkers fit them together in such a way as to create functional furniture. Once A Tree can help bring to life your style and your design. 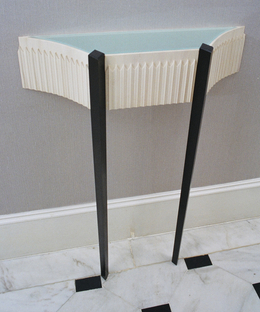 In the photos on this page a variety of construction methods are shown for creating table legs. In the organic computer desk the legs are built up of thin slices of wood to create a laminated leg. 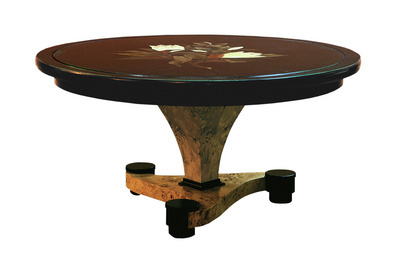 The elegant legs of the demilune table were stained to give a striking look. 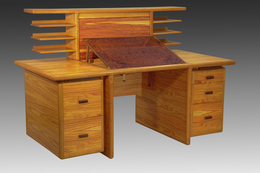 The shaker style desk draws on the beauty of the wood to enhance the simple design. Please give a call and in an esthetically pleasing way we can build a structure to hold objects off the floor - We make tables and desks! At Once A Tree we are always working on antiques. We build tomorrow’s antiques today.